Perfect Metal Id Scanner & Alloy Grade Verifier. Takes Just Seconds! Positive material identification (PMI) applications range from construction steel to surgical instruments, from metal scrap to aerospace equipment. The range is enormous, but we have a solution for your PMI testing needs. Do not hesitate to use the contact form to find out easily and quickly how Bruker’s rugged yet advanced handheld X-Ray Fluorescence alloy tester machine (what we in the trade call “a PMI gun”) can serve you, and whether or not it is your best option compared to the alternatives. Hand in hand with the importance of reliability and safety comes the need for high quality, reliable and compliant metal alloys. Justifiably, the world has stopped taking chances with its alloys. Ever-evolving quality control standards, public awareness, and regulatory requirements make PMI positive material identification a necessity rather than a choice. When you need a reliable, fast PMI gun, Bruker offers easy and completely non-destructive testing equipment for every metal component. For most industries, a PMI analyzer is particularly important in order to avoid events such as premature corrosion, blackouts, and even explosions, all which have been traced to the use of the wrong metals. Bruker PMI equipment can protect your investment and ensure the safety of your operation. Contact an expert today to see how a PMI gun like the S1 TITAN can meet petrochemical industry regulations while increasing your profitability! 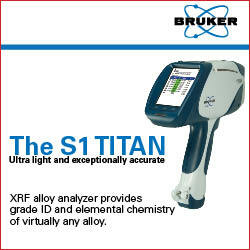 Verify alloys and other metals in seconds. Confirm the integrity of your equipment. PMI positive material identification equally applies in the fabrication process, where Quality Assurance requires alloy verification. Many of our clients, for example, must fully comply with ISO9000 certification, which requires 100 percent alloy verification. Such applications particularly apply to parts designed for use in petrochemical industries, or other areas where high temperatures and pressure occur. Bruker PMI portable guns enable you to verify alloys early, preventing high costs associated with the possibility of metal mix-ups. Reduce scrap and improve your product quality with positive material identification analyzers, right here with the Bruker S1 SORTER or the top of the line S1 TITAN! Send us your questions! And if you can, see us at the 2014 ISRI Convention. Don’t forget to follow our XRF Technology and XRF News.